The initiative uses the power of radio as a mass medium to raise awareness against the objectification of women! 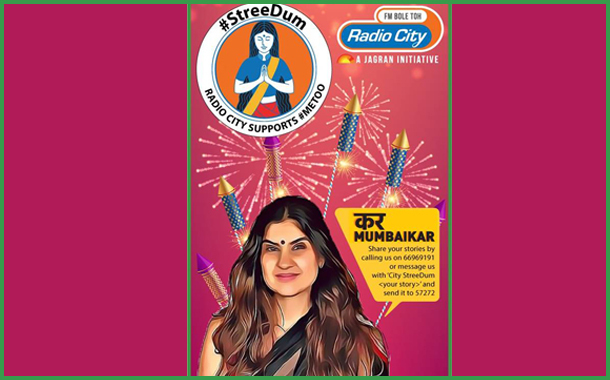 Mumbai: Radio City 91.1FM, India’s leading radio network, initiates a week long campaign “StreeDum” in Mumbai, this Diwali to eliminate the objectification of women. The thought behind the campaign is to recognize the widespread and deeply ingrained mentality of the majority in the Indian society that looks at women as objects of sexual gratification alone. The aim of the campaign is to create awareness about this issue and address it on a large scale through Radio City’s Breakfast show RJs Salil & Archana. Radio City’s “StreeDum” is an extension of ‘Kar Mumbaikar’ initiative, which has been successfully utilising the power of radio to influence a positive change in the society. ‘StreeDum’ campaign will run across on air, on ground and on social media. As a part of the on air campaign, listeners can share their real life experiences with RJs Salil and Archana. Radio City will substantiate these stories on air by explaining how objectification is an unfortunate but every day phenomenon in the life of most women across the world. Through the digital route, Radio City will have experts explaining the various forms of harassment on video and advice the possible legal recourse a person can take if they are facing such a situation. On the backdrop of the festive season, Radio City aims to run a social engagement campaign where the female RJs of the channel will spread awareness against casual sexism. After successfully addressing and solving various issues like plastic ban, monsoon related issues in Mumbai like beach clean- up and filling potholes in the previous leg of Kar Mumbaikar, Radio City is all set to stir the ‘janta’ of Mumbai, urging them to respect women and consciously stop objectifying them with the “StreeDum” campaign.